The subsonic tunnel is a recirculating wind tunnel with an optically-accessible 61 x 61 x 122 cm (2 x 2 x 4 ft) test section. The flow speed is continuously variable from 10 to 93 m/s (32 to 305 ft/s). The freestream operating temperature can be maintained within 1°C by a heat exchanger. A hexagonal-cell honeycomb upstream of the test section and high-efficiency turning cascades in each of the tunnel elbows result in freestream turbulence levels on the order of 0.25%. High-porosity screens located downstream of the test section act to catch any debris that may come loose from the test model. The dynamic and static pressures are monitored via pressure taps at the inlet and outlet of the contraction section. Airfoil models are mounted across the tunnel span and supported by 30.5 cm (12 in) diameter ports on either side of the test section (Fig. 1). These ports allow for manual changes to the angle of attack, which is measured using a protractor on the sidewall. The test section floor is also removable to allow for alternate floor configurations. Figure 1: Airfoil mounted in test section and two cameras. 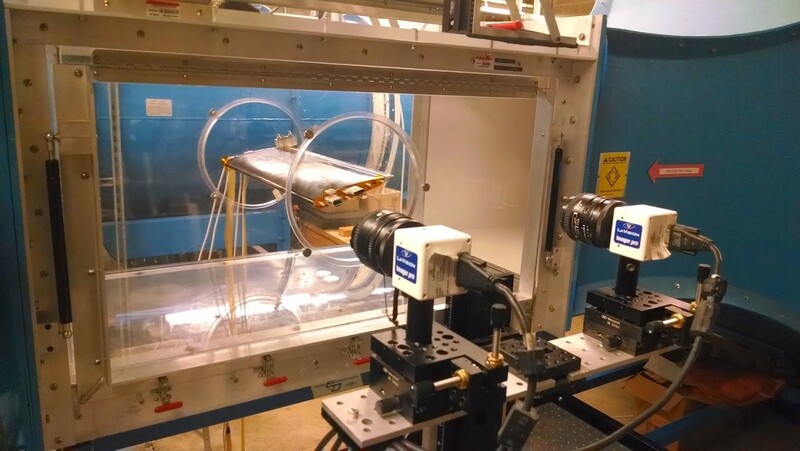 The facility has recently been used to investigate the effects of nanosecond pulse driven dielectric barrier discharge (NS-DBD) plasma actuation on flow separation over an airfoil in fully-reversed condition, i.e. with sharp-edge leading and blunt-edge trailing. This configuration is representative of the retreating blade side of a helicopter rotor with high advance ratio. Flow visualization is accomplished using two-or three-component particle image velocimetry (PIV). When performing PIV, a LaVision atomizer located upstream of the contraction section introduces nominally sub-micron DEHS seed particles to the flow. The PIV system uses a dual-head Nd:YAG laser rated at 400 mJ/pulse at 10 Hz. A series of spherical and cylindrical lenses forms the laser output into a thin sheet that enters the test section from the top and bisects the section streamwise. Images are captured using one or two 4.2 MP CCD cameras.